The ongoing blog discussions on Brendan Stone's treatise on Zimbabwe and the general state of Zimbabwe's economy have highlighted the importance of understanding different perspectives on the state of play. A key contested area between the Zimbabwean Government and some external observers relates to the 'true' nature of inflation in Zimbabwe. I thought it useful therefore to share the two short working papers** produced in April 2007 by the IMF (same authors) - these are just one perspective on a complicated issue, but worth hearing what the folks in Washington have got to say. The first paper Central Bank Quasi - Fiscal Lossess and High Inflation in Zimbabwe : A Note basically argued that inflation is running wild because the Central Bank is being forced to support Government policy by taking on functions that would be done else where through 'quasi fiscal' measures and keeping the currency over valued. In short Zimbabwe has resorted to printing money and issuance of central bank securing which has led to inflation going beyond 1000% in 2006. The second paper Lessons from High Inflation Episodes for Stabilising the Economy in Zimbabwe puts the situation in Zimbabwe within a larger context of what happens in places of hyper inflation. The paper offers optimism noting that Zimbabwe's situation is not beyond redemption - "stylized facts show that in a successful stabilisation inflation tends to fall very rapidly while output recovers within the first or second year of stabilisation. Median inflation [of the sample of countries surveyed] fell from a peak of about 1,600% to 180% 12 months after the peak". Both papers have recommendations on what Zimbabwe needs to do to get itself out of this mess, but I doubt that the Harare Government is listening. I'll let you decide whether they should be listening. **Footnote - the papers are fairly readable and with some interesting graphs. "Thomas Mumba died on April 20, 2005 when an explosives depot blew up in the Chambeshi copper mine. He had just turned 23 and had been working in the mine for two years. To this day, no one knows how many people died that day, because the mine's Chinese owners attempted to cover up what they knew about the accident. Besides, they had kept no records of who was working near the explosion site on the day of the accident". Extract from a new Spiegiel Online article on China's growing economic influence in Africa entitled Age of the Dragon : China's Conquest of Africa. A new Government bank for farmers? Media reports suggests the Government plans to re-open the Cooperative Bank for farmers. According to Agriculture Minister Ben Kapita, the move “will enable small scale farmers have access to resources to improve their agricultural activities”. We have been discussing for a while on this blog some key potential farming reforms. One of those key areas is access to credit for small scale farmers. However, I put to the government that in takingthis measure forward we should try and learn from past failures by improving in two particular areas. First, the bank should run as independent from Government to avoid the corruption that pervades most Government centred ventures. Related to this is that the bank must be self financed to ensure that tax payer liability is kept to a minimum. This naturally means the bank would provide credit at positive but sufficiently lower rates to enable farmers to invest and still be able to pay back – this could be accompanied with a potential break of five years to allow small farmers to make progress with new farm start-ups. Secondly, improvements in access to credit must come with broader reform in access to land and greater provision of agricultural focused education. Farmers need access to land to ensure that it is properly used. As we have discussed many times of this blog, a lot of our land remains dormant. On education, it does appear that there’s a strong mismatch between investment in agricultural centred education and the emphasis to make agriculture the cornerstone of our economic growth. It’s about time we considered establishing dedicated agricultural centres of learning in each province. If the agriculture sector is going to continue growing, farmers need easier access to land and the necessary “know-how” to employ the latest and most effective farming methods. We continue to cast our 'economic eye' on our brothers down south with today's new report by Channel Four on how "the discovery of new diamond fields in Zimbabwe has sparked a rush to mine these valuable status symbols" - article and video [after a 10 second advert :) ]. A while back I did a blog on "Should we spend more money on prevention or ARVs?" . The discussion centred around Professor Canning's assertion that rather than spending more money on trying to heal aids patients with ARVs, poor countries like Zambia faced with the choice to either spend money on prevention through contraception and other things or spending more money on ARVs, should do more of the former, than the latter. Professor Canning's brilliant paper published last year in the Journal of Economic Perspectives is now available online entitled "On the economics of HIV/AIDS in low income countries: the case for prevention". An interesting survey this week apparently shows that "Zambians consider the settling of water bills as a least priority on their expenditure list". You can read more here. Apparently this is due to "competing needs" and taking water for granted because we have so much of it around us - at least that is what NWASCO director Osward Chanda reckons. Actually this story reminds me of a recently published paper by Banerjee & Duflo called "Economic Lives of the Poor", that appears to give Mr Chanda more ammunition. The authors note that our poorest members of society retain some choices on how they spend the little they have. The poor don't seem to put every cent (or ngwee) into essential items like food or water, they do spend a larger proportion of it on non-essential items like entertainment (television sets, festivals) and alcohol. The paper is wonderfully written, but I'll let you be the judge on the substance! Laura Miti-Banda's debut piece on UKZambians website "Looking for the next President" echoes the points I have been making on the "pre-eminence" of institutional reform. Worth a read. Herman and I had previously blogged about how to ensure that Zambian graduates have equal accesss to jobs as foreigners. It seems Government has new ideas of its own - they have gone for selective banning of certain work permits. Permanent secretary of the ministry Ngosa Chisupa is quoted as saying "government will disqualify applications for work whose professional skills could be offered by Zambians". I remain skeptical. For one thing I don't see how banning truck drivers helps indigenous "professionals" - presumably these are non-professional jobs. Secondly, even if this was extended to other jobs as Mr Chisupa intimates, I still think "banning" people is not the way forward - improving information between foreign companies of any sort and the Zambian graduates remains the best remedy. I have watched with some amazement at the recent flurry of discussions on corruption following the London judgement on our ex President FTJ. The issue has been much debated on every Zambian blog, forum and newspaper. As always these discussions have been led from the frontline by the Post newspaper, whose daily editorials on “Chiluba the plunderer” has now fuelled unpleasant exchanges between two ex-Presidents : the post columnist KK and the accused FTJ. But is the nation now in danger of losing focus on the issue of corruption? My concern here is not so much whether FTJ really stole more than KK (as the Post have been quick to say - KK is a saint says the post) or whether FTJ should not have been tried in London or whether FTJ is guilty at all or not. Neither is my concern on the “moral” stand on corruption – we all know it is morally wrong to practice any sort of corruption. Rather my concern as always is purely economic. The central issue is whether we have lost the plot in focusing too much on corruption as the cause for our slow progress in developing as a nation. It may surprise the Post Newspaper editors to learn that the economic question of whether corruption is a major influence on Zambia’s economic growth is an open one. For one thing there’s no single Zambian paper that I am aware of that has addressed this issue at the macro or micro-economic level. Secondly, the cross country evidence is actually mixed. Yes, there’s some micro evidence that corruption can lead to low firm productive and misallocation of entrepreneural skills, but at the cross country level it’s been constantly found to be insignificant for growth. The last person to reach this conclusion was Svenson (2005) in his paper "Eight Questions on Corruption". He notes "most of the theoretical literature as well as case study and micro evidence suggest that corruption severely retards development. However, to the extent we can meausure corruption in a cross country setting, it does not affect growth". Svenson goes on to speculate that a plausable explanation for "the mismatch between micro and macro evidence is that corruption takes many forms and there is no reason to believe that all types of corruption are equally harmful for growth". In fact some economists have suggested of late that China and India would not have experienced the kind of growth we see today on a strong anti-corruption policy. It seems fighting corruption does carry some costs as well, if it is done at the expense of other targets. Does this mean that I think we should just ignore corruption? Absolutely not. However, my view is that we should address corruption as part of a wider debate on what we think are the key obstacles for Zambia’s economic growth. And one of them is definitely a "poor institutional framework" – but an institutional framework goes beyond simply tackling corruption, it is about introducing stronger governance and accountability structures. Participatory democracy and general decentralisation is one of those things that have been empirically verified to work in increasing growth. And we know that Zambia has not made strides in this area as recently noted by the OECD report. Another crucial area is poor infrastructure. We know that our educational infrastructure is need of revamping, especially in conjunction with stronger agricultural policies. We also know that tourism infrastructure requires more investment as also recently cited in the OECD report. Another area we have been discussing on this blog is access to credit in the context of agricultural sector. We need to develop local financial markets to encourage the poor to have access to credit. Encouraging more micro lending would seem to be a good first step in that direction. So as we debate the issue of corruption, in terms of who stole what, what penalty and so forth, let us not forget that corruption is just part of a broader debate on moving forward as a nation. It is germane to development, but perhaps much more important are broader areas like institutional reform, improvement in local financial markets, and most importantly improved infrastructure that supports agricultural, educational, mining and tourism policies. Reports in the media suggests our negotiating position on EU EPAs is being hampered due to lack of specialists in international trade. This is the second time this issue has been raised. Its most unfortunate, but most importantly highlights our short sightedness. There's no doubt that there are Zambian international trade economists abroad who could do the job. The problem is that Government isn't taking a more expansive approach and trying to get those experts people abroad more involved - its not "living with a leaking bucket". As such we look embarrasing to the world. COMESA have now comfirmed the intention to press on with the Customs Union in 2008. I reported previously that Zambia faces a choice between SADC and COMESA. The above chart was quoted in the World Bank paper we have discussing on Zambia's brain drain. As has been noted in those discussions the chart has profound implications for our country educational policy, not least because of the smaller share of "agriculture". One problem : the source is proving elusive!!! At least the "physical" evidence. I have exchanged e-mails with the authors who point to United Nations (2005): Human Development Index Report. My search through that document came to zero. So am going back to the authors again for more substance - they have been fairly warm thus far including pointing me to the new book on Zambia, which I have purchased (reviews on it down the line, after I have worked my way through my current summer list). In the meantime if anyone has some idea on how to obtain such information or similar data I would be extremely grateful. Especially if it is more up to date. One would certainly have thought this is a critical piece of data for the Zambian Government to have and they should be plenty of it on the net. But I am struggling!! Equinox Minerals have released a new video presentation of the Lumwana Mine - Flash or Windows Media. OECD's belated assessment of Zambia's economic outlook for 2007. The OECD commentary is more wide ranging compared to what we normally get from other institutions, as it covers social and political developments as well. So it is not strange to find statements such as "Zambia's local councils are among the least funded in Africa at about 2% of the national budget compared to the average of 15%" . Its therefore interesting to read their "outside" assessment of the new constitution debate: "the drafting of a new constitution faces continue delays because of weak political will and lack of funding....Zambians are unlikely to have their long awated constitution before the end of the current Government in 2011". The Economist Magazine on the rapid drift of our neighbour back to the dark ages. 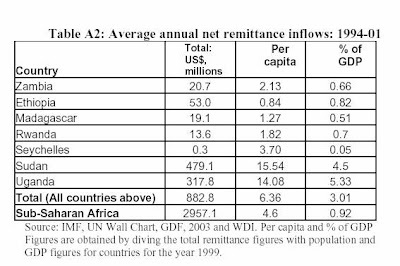 Thanks to Yakima for pointing out this interesting table from the World Bank paper we have been discussing on "World Bank on Zambia's brain drain". It appears to show that Zambians abroad send less money compared to others. While statistics can always be debated, it does raising an interesting "why?" question. A new report by the Save the Children provides new statistics on the rate at which young children perish around the world. Zambia is one of 20 countries that has made little or no progress in terms of child survival. In Zambia – statistically speaking – every mother is likely to suffer the loss of a chid due to a largely preventable cause. We clearly can do more in this area because if other poor nations like Malawi , Nepal and Bangladesh are making progress, I see no reason why we cannot. Apparently, Malawi's success owes to simple and costless solutions like distributing nets that protect children from malarial mosquitoes. For others, a simple focus on family planning was central to progress. Its very telling, that the report notes that "political will" was an essential ingredient of success — code word for visionary leadership that puts child mortality at the heart of the social agenda. The Save the Children report also draws on the new UNICEF Report - State of the World's Children 2007. Post Newspaper Columnist Mweelwa Muleya writes in today's edition on possible areas for land reform. Article reproduced below. There is serious need for the Zambian government to cautiously and fairly manage measures aimed at implementing the liberalisation and privatisation of land ownership. There is growing concern and apprehension among the members of the public, including some government officials, that if not well implemented, the liberalisation of the land policy may exacerbate rather than reduce poverty in the near future. As everyone knows, land is one of the principal factors of production and almost an exclusive source of livelihood for the majority of poor rural dwellers with limited access to financial institutions and other sources of income. Hence, farming of cash crops and animal husbandry, which are dependent on the availability of fertile land, are the mainstay of their livelihoods. The MMD government under the leadership of President Mwanawasa seems to be clear about these facts partly because Mwanawasa is a farmer himself. However, there seems to be an institutional (or is it individual?) problem in empowering of local people in land ownership.Recently, President Mwanawasa advised the traditional leaders, through the House of Chiefs, to desist from giving “huge chunks” of land to speculative investors. He went on to explain how in some cases he had to intervene in the allocation of huge tracks of land to investors who were simply gambling on land. It is important to realise that land is more than gold and in this globalised world, the scramble for land is taking an apparently harmless but actually harmful approach. This is worsened by the inferiority complex of some of those charged with the responsibility of managing this rather critical national resource called land. In particular, the word investor seems to have only applied to foreign nationals coming to do whatever business in Zambia at the expense of serious local investors. As a result, more incentives are being given to foreign nationals, including the speedy manner in which documentation for land ownership is being done. There is nothing wrong in being efficient when dealing with investors because that is the only way of attracting them to do meaningful business in Zambia. However, the source of complaint by most local people is that they are not being given the same urgent attention as foreign investors in legalising ownership to their land. This is preventing them from using land as collateral to obtain financial assistance to develop their farms. On the other hand, some nationals are provided with financial resources by their own governments as long as they can prove that they have been granted an investment licence in Zambia. In fact, they are even given collateral by their own countries or comfort letters from their banks to facilitate the acquisition of investment licences. This gives them an added advantage and are able to invest in poultry and piggery, the sort of investment that could be easily done by the locals if there was a deliberate policy to empower them with land ownership and financial resources. It is hoped that with the recent restructuring at the Ministry of Lands, there will be efficiency, transparency and fairness in the procession of land records and deeds. It has taken some people more than 10 years to get title deeds to their land, while others have completely lost their files at the Ministry of Lands. Unless the capacity and attitude is positively enhanced at the Ministry of Lands, the much talked about citizen empowerment may elude the majority of the most deserving poor, especially in rural and peri-urban areas. Within the concerns raised by President Mwanawasa regarding giving huge tracks of land to speculative investors by traditional leaders, the government should also be forward looking to ensure that the future generation is not landless. At the rate the parceling of land is going, every square meter of land, including rivers and streams, may be under some landlord, including absentee ones, in less than 10 years in Zambia. The majority of rural people, who are pastoralists, may have no where to graze their animals from. Mind you, not everyone can afford to keep 10 animals on two acres of land and feed them. Drilling a bore is a life dream for many. In fact, some people are even expressing fear that Zambia may find herself in a situation where there are Bantustans- rural poor people being pushed to unproductive pieces of land to pave way to private ownership and profiteering by those with capital. Indeed, in modern governance, sustainable development is dependent on interdependence, including on foreign investment. As a result, foreign investment should be encouraged by all means, including spending money in luring investors in order to make money. This is more reason that the demand for equal treatment by local people should not incite xenophobia, racism or any form of discrimination. However, the concern of the majority of the people, including some traditional leaders such as chief Mukonchi, is that such investment should also benefit the local people. In other words, the government should critically look at the benefits of investment to local communities and the country at large. The growing concerns about investors milking this country dry without adding value to local communities must be addressed by the government. And that should begin with the manner in which land is being parceled out. There should be no discrimination, but affirmative action should be the catch word in citizen empowerment-in practice not in theory. There are cases where, during the process of transferring traditional land to state land, communities who are sitting tenants are being subjected to compete to get title to their land with people applying for the same land. As everyone knows, the process of applying for land ownership to the Ministry of Lands, and being offered before getting title is still alien to a good number of people out there. All they know are their boundaries. Regrettably, in some cases they have been shocked by a strange visit by someone waving title deeds to their land and ordering them to vacate because they have been illegal squatters for the rest of their lives! This calls for the strengthening of other institutions such as the Lands Tribunal and civil society organisations such as the Zambia Land Alliance to protect the rights of the people in lands matters. Prevention is better than cure and Zambia is not ignorant about the land problems taking place both in the region and other continents where population explosion and cut throat capitalism have spurred the scramble for land. The Scottish Herald reports on the work of the Mthunzi shelter on the streets of Lusaka that is giving hope to street kids. Are Zambians doing enough with the internet? Its now just over 100 days since I entered the world of Zambian blogging. It has been an exciting and challenging period of meeting Zambians and most importantly exchanging ideas on the challenges facing the best nation on earth. Many thanks for those who regularly read the blog and find time to drop some ideas and kept the dialogue going. Your contributions continues to make my blogging a learning and addictive experience! I guess the “100 days” anniversary of the blog provides an ideal opportunity to offer a few reflections on the state of Zambians' personal use of the internet, in particular in the area of blogging and the general exchange of information. I have been particularly struck by how few Zambians are blogging on the net. Surprised because I would have thought with 10% of our educated elite abroad and with incredible access to the internet and abounding with new ideas, conversations will be aplenty. For a nation facing such huge challenges we are not doing our very best to discuss these issues at a deep level among ourselves and networking our ideas, with the view of influencing policy development. If Government is not listening, we are certainly not talking! 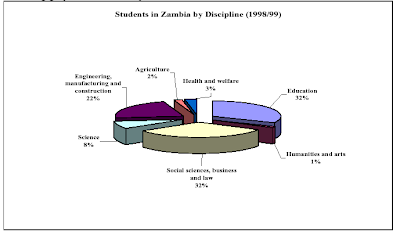 To make it worse, the majority of the few blogs that are discussing Zambian issues are mostly written by students on a “year out” in Zambia. It’s not uncommon to find a blog on “Ben in Zambia” or “Sarah in Kitwe”. There’s nothing wrong with these foreign students blogging, I just wish indigenous Zambians did not let western students define the image of Zambia to the world. We have let others project an image of Zambia to the world for us. This malaise has extended to “Zambian discussion forums” as well. It’s bad enough that there are few positive forums out there, what has puzzled me is that the most popular of them, Bwanji continues to project a poor image of Zambia to the world. On Bwanji Zambian students from around the globe converge to exchange profanity and ignore the trade of ideas. This lack of trading in ideas is extremely disappointing. It is very important that Zambians at home and broad work hard to exchange ideas and get involved in the debate through blogs and positive forums. To my mind, the reason why some countries are so rich and others so poor is down to the area of "knowledge". Economic historians have for some time been puzzled on why Portugal, so prosperous in the 15th century began to decline from thereafter. A lot of reasons can be put forward, but one common and unmistakable reason was the decline in the trade of ideas. In Francis Parry's 1670 observations, "the people are so little curious that no man knows more than what is merely necessary for him". Indeed the 18th Century visitor to Portugal, Mary Brearley remarked "the bulk of the people were disinclined to independence of thought and, in all but few instances, too much averse for intellectual activity to question what they have learned". I fear the same can be said on why Zambia remains poor today. Zambians at home and abroad trade very little in ideas. We are not doing enough to step out of the confines of our daily preoccupation and use our individual gifts to extend Zambian intellectual thought and help those in Government to think differently. You don't have to be in academia or Government to do this - all of us have something meaningful to say! If you are into IT, have a blog on IT in Zambia, if you an economist, reflect on Zambian issues, if you are an artist, blog on Zambian art, if you are an historian, blog on Zambian history, and so forth. Through this intellectual exchange we will go on to build a better and new Zambia. Through this process, we can network and somehow help shape policy debate in Zambia. As David Landes puts it “if the gains from trade in commodities are substantial, they are small compared to the trade in ideas". When all Zambians learn this principle, we will then begin to lift ourselves out of poverty! Zambians abroad constantly condemn Government for poor policies, but if our forums are full of profanity and we are weak on intellectual discussions online, are we really in position to criticise? If we aren't doing enough as individuals to think through issues via blogging and other things, can we really blame Government when the policy solutions appear inadequate? My hope is that Zambians will now do more to start discussing positive ideas, stirring each other to progress, and most importantly networking. Zambia will only develop once knowledge sharing improves. In this vein I have listed some interesting Zambian blogs and forums that I have come across. We must do all we can to support them. If you are aware of other positive Zambia blogs and forums not listed below please let me know so I can add them to my directory. Let us keep the Zambian candle of positive dialogue going, for we are the guardians of our time. As the banking sector in the country enjoys a boom in the recent years largely driven by increased international trade and wider growth of the economy, it appears that the banks have not kept apace with these developments. I strongly wonder if most of our local banks are prepared to handle the increased demand especially from the smallest clients, as these clients demand a lot patience, education and guidance on banking procedures. Its now very common to find small scale businesspersons like marketeers and charcoal burners on ATM queries prefering to access their accounts ‘electronically’. I have seen in some cases that increased demand for banking services has overwhelmed a lot of our banks in Zambia. Its quiet common to witness a situation where the cashier is seemingly annoyed at someone for not knowing what do next. Its seems most banks are really overwhelmed by the workload and are not responding to this surge in demand. In my view, the banks should be doing more to use the latest technology as a way of addressing these problems. Though a good number of banks have nice flat screen computers, its evident that they are not fully employing them. Take for instance, if I want to make a counter withdrawal from Lusaka, the teller will have to fax my withdraw slip to a Copperbelt branch, where I hold an account, so as to confirm my signature. This is not supposed to be the case with the advent of ICT as the branches can easily be networked and information accessed as and when required. I implore all banks to ensure that they fully employ ICT as a way to reduce their workload, where clients can now access account details online or away from bank premises. Interesting to see that within a year of Kabwe making it in World's 10 Worst Pollution Spots money is now at the door in form $50m grant from the World Bank to help clean up the damage. It does indeed seem that the world is much quicker to respond to "environmental damage" than damage caused by "poverty ". I guess we have the "environmental" lobby to thank. Just a shame that the "stop poverty" lobby isn't as strong. Imagine asking the World Bank for $50m to tackle the problem of street children in Kabwe? Would they respond to the query with the same urgency? A new World Bank research paper on Migration from Zambia provides new contributions on Zambia's brain drain problem, noting that this is a big problem for Zambia as 10% of all tertiary educated Zambians live abroad, although this figure is much lower than other countries in sub-Saharan Africa. The authors assert that the current "skill shortage and brain drain related problems in Zambia must go to the root of the problem". The root of the problem according to the paper is "primarily due to inadequate educational infrastructure". And they have facts to back it up: "Government expenditure is currently only 2% of GDP, the lowest in Africa and well below the 3.4% average of least developed countries. The problem of low education expenditure is compounded by the way it is allocated. Students in health and welfare constitute about 3% of all students at tertiary level - only 7 countries in the world have a lower percentage". The solutions? The authors are clear : "The primary solution to the shortage [skills] lies in producing more skilled workers". I am not convinced. Yes skill shortages is down to poor investment in educational infrastructure, but as the paper itself admits, its down to emigration. What good is producing more skilled workers when these workers will emigrate? The authors have not shown enough evidence that more investment in educational infrastructure will necessary mean less of the brain drain problem. Their "primary solution" is the classic filling in a leaking bucket. At what rate of investment must we invest in these skills, to ensure the bucket is always full, when we are losing people abroad every second? The central issue to my mind is that the problem of the brain drain will persist as long as the economic incentives for going abroad are there. We therefore need to focus solutions on the "economic incentives" . It's not the quantity of the educational investment that matters, it the quality of the investment. We need "right" investment. Investment that will incentivise people to create jobs and work for themselves. The pressing educational policy debate in Zambia that has so far been ignored by Government is a simple one - How do we shape our educational curriculum to ensure that it produces individuals who will create jobs for themselves and others, and will have less incentive to go and look for a job abroad? I guess the authors were led down this route of "producing more skilled workers" because the other policy alternatives looked less attractive. For example, for sceptics who believe that Zambia can limit the brain drain through restricting skilled emigration, the authors have a telling response. No we can't, and the case in point is Zambian doctors. 300 Zambian doctors practice abroad while the estimated shortage to meet the basic WHO recommended standard stands at 1654. What about compensation by host countries? It does not work, says the authors, as Zambia has found out talking to the UK over the many nurses who have left Zambia and working in the NHS. Alternatives policies aren't working either. Zambia has taken steps towards retention and voluntary return of those settled abroad but these schemes have only had limited success. The recent NELMP specifically addresses emigration and seeks to attract skilled Zambians home for example. We also launched a "bonding" system which requires all Zambians who are awarded a publicly funded scholarship to sign an agreement to return after completion of their studies. These schemes aren't working because they are not compelling enough. They rely on people to "honour" their word. As the authors rightly note, "the strong economic motives which propel much of the skilled emigration from Zambia tend to dominate the moral incentives to return". All this leaves the authors haplessly championing temporary migration agreements between Zambia and western nations, and of course the need for larger educational infrastructural investment. The former as I say is not clearly stated, the latter relies on greater cooperation between host countries and Zambia. The idea of temporary migration is to get countries to allow temporary Zambian emigrants to stay in their countries for a brief period only and then once these people work their for a while they can come back with hopefully even better skills. It seems wise but as the authors note, it relies too much on goodwill of host countries to repatriate the "brains" back! So it is just as difficult as securing compensations. As I argued in living with a leaking bucket, the real solution lies in the Government finding ways of leveraging Zambian expertise abroad back into Zambian development on a non-committal basis, and also ensuring the education curriculum is designed to lessen the incentives to leave Zambia once you finish school. In that sense, I share the authors conclusions that a commitment is needed on educational investment and external cooperation, we just disagree on the nature of this educational investment and who we should be seeking cooperation from. In my view let us give Zambian experts abroad an opportunity to contribute to development at home in a non-committal basis, and crucially let us realign the incentives to remain in Zambia by having an education policy that encourages people to create jobs for themselves and others. World Bank's eFindings looks at how Celtel are doing their bit to combat corruption. It concludes that the Celtel story shows emphatically that it is possible, if not always easy, to run a successful clean business in Africa which can benefit all stakeholders and help to enable development. Mike Bingham in the latest update of the Lowdown Magazine has a fascinating piece on Chikanda, An Unsustainable Industry. Mike solemnly warns that unless action is taken to preserve the industry, "the orchid populations will decline until it is no longer worthwhile searching for them, and those who harvest them will find some more profitable way of spending their time". Well worth the read especially for those that love eating chikanda! A Malaysian firm apparently believes that there's new demand for public relations management in Zambia. So they plan to set up shop! Read more here. Yesterday's announcement by Zambia Skyways and Air Zimbabwe that they plan to launch new routes to London and Dubai from Lusaka, is a timely caution against Government's recent ideas for a national airline. Sarah Sayifwanda the new Minister of Communications and Transport has a remit from President Mwanawasa of ensuring " the matter of the establishment of the national airline was speedily concluded and brought to cabinet for a decision". In reaching any recommendations for cabinet, Sarah needs to reflect carefully on the global, continental and national nature of the aviation market. Due consideration is particularly needed to the real problems that the Zambian aviation market faces and the best way of handling them. The air travel industry across the world has been going through a process of liberalisation. The 1990s saw the deregulation of the US aviation market, and now we have seen new programs in Europe like SESAR and the latest Open Skies agreement push the boundaries even further. In Europe & US the rise in low cost carriers (so called no-frills) continues to grow and these models are now being copied in other parts of the world. China, South Africa and India serve as the latest examples. All of this growth is private sector led. Simply put, aviation demand around the world is rising. Even in Zambia, the resurrection of Zambia Airways and now the new Zambia Skyways - Zim Airways alliance deal to London and Dubai (at possibly as much as £200 cheaper per London trip compared to the incumbent BA ), proves that the market is best placed to handle growing air travel demand in Zambia. The market can handle this demand as long an enabling environment exist where the new low cost models can thrive both within Zambia and connecting Zambia around the African region and beyond. Several airlines are already exploring Lusaka & Ndola with the possibility of connecting them to the European and Middle East destinations. The lack of a national airline is a good incentive for new aviation investment in Zambia because it provides comfort that foreign airlines won't be discriminated against in terms of slots and regulations in preference to a "national airline". Government ownership of a national airline is the last thing that the nation needs. Aside from dissuading other airlines from offering services, few countries in the world except the Arabs with vast amounts of cash own airlines anymore. It is too expensive and the industry is too volatile. And there's a moral argument as well - why should most Zambians who don't travel abroad, pay taxes just to enable the richer Zambians to travel? Surely the tax payer's money can be spent on something more useful? The best thing that Sarah should be thinking about is to create a good coherent airport strategy for the whole country and provide an enabling environment to help attract low cost carriers. Let us look at the state of our airports (starting with Lusaka and Ndola Airports) and then let us offer new incentives to the low cost carriers. We must not waste money on a new national airline. Thanks to UK Zambians for pointing out the PWC assessment of the 2007 Budget called "beyond figures". An interesting read. Quantum leads, now Government must follow. First Quantum Minerals recent announcement that it plans to spend K1 billion to rehabilitate roads in Ndola should be applauded. Its also good to see that FQM are looking at other roads. Last month I called for a new approach to local infrastructure funding , where new local investment should be tied to provision of local infrastructure such as schools, hospitals and local roads. While, FQM's current plans are focused only on roads, it is still good to see that FQM are taking a leading role in the absense of a clear framework from Government. In their own words “The spending of the K1 billion was part of the FQM community social responsibility to the people of Ndola”. Its a pity that Government has not woken up to the importance of making such social responsibility a legal requirement like it is in other countries. Its my hope that FQM's actions will stir a debate on the merits of private sector led investment on local infrastructure.